It is not often I walk away from bib pickup teary eyed. 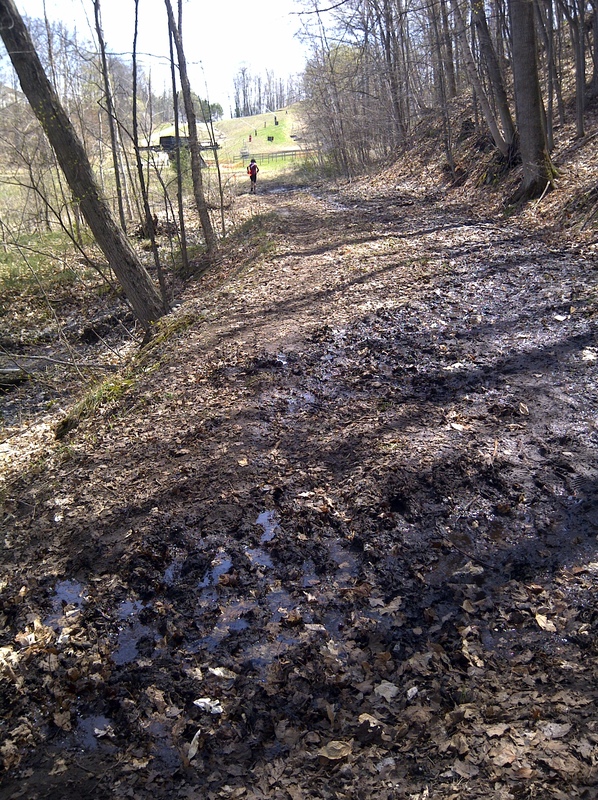 It was April 28 the day before my 50 kilometer race at Pick Your Poison. 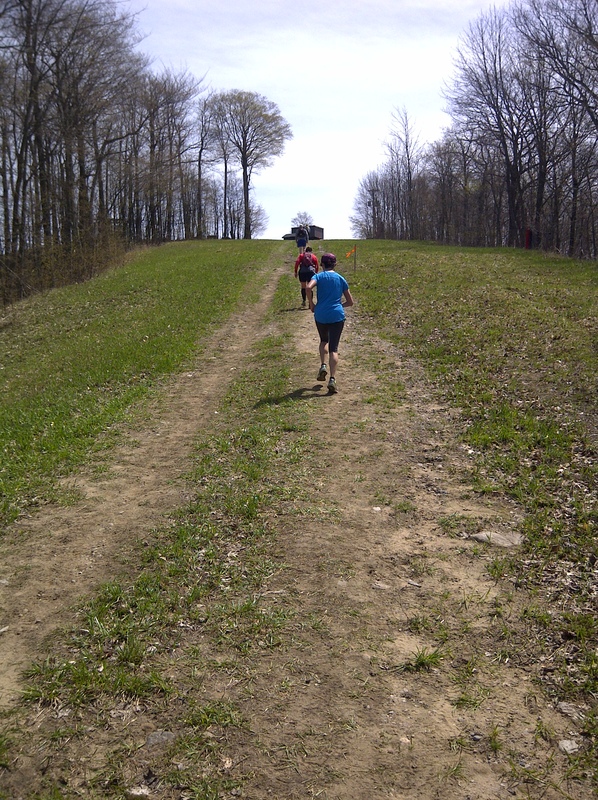 It is a very popular race and the first race each year in “Outrace“(Ontario Ultra and Trail Race Series). When I mentioned my name “Carl Wright” to the volunteers at the bib pickup table, race director Heather overheard my name, came over and warmly welcomed me. She briefly shared my story from the 2016 Pick Your Poison to the volunteers who amazingly remembered what took place last year. 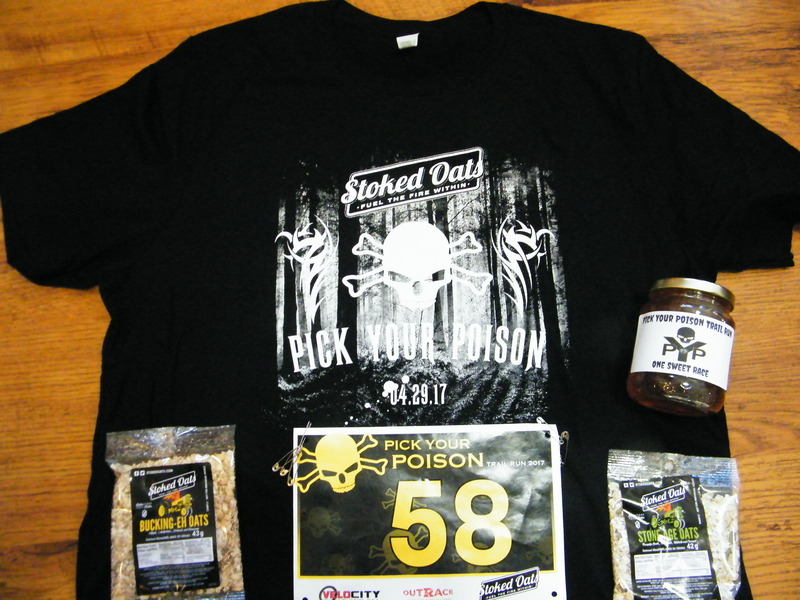 After a nice visit, I gathered up my event shirt, Stoked Oats, sweet local Pick Your Poison honey and my bib. On my short walk back to my car I looked at my bib. It was number 58. How cool was that. The same age I am. Once home I posted that number on my Facebook and Twitter saying “I knew that my race day was to be amazing”. Then I proceeded to get my drop bag and race gear ready. The Pick Your Poison race is very dear to my heart. The Copeland Forest, where much of the course goes through was only 4 miles from where I grew up. I live that same distance now, but on the other side of Copeland Forest. And it is only 8 miles (a 12 minute drive) to the start/finish line of Pick Your Poison. That same forest is where I currently do a fair bit of my training. Not part of the Pick Your Poison course, I go into various and different parts of Copeland Forest for my training. It is also the event where my ultra running journey began. Last year I had registered for the 25k (or 2 loops) in the Pick Your Poison. And while running my final second loop with my niece Caron (who was running in her 1st 50k Ultra) she said “I’m Going To Miss You Uncle Carl“. And midway through my second loop I made a decision that changed me. 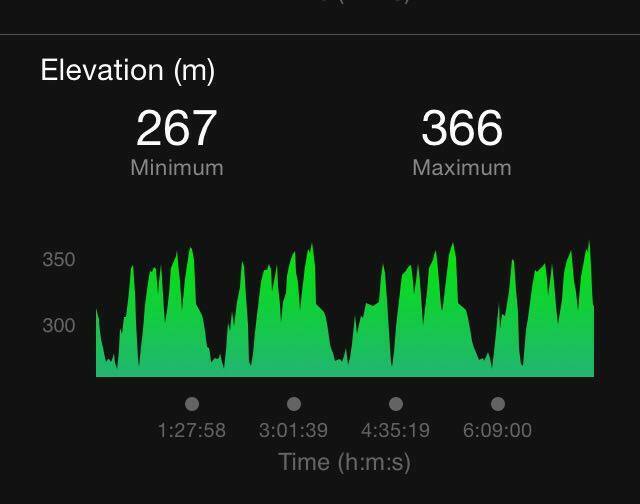 Without training for a 50k, I ran those two extra loops with Caron. I learned a lot about the “inner me”. I experienced the feeling of not having anything left in the tank, reaching down and discovering there was still more there. The earliest running club photo I could find taken in 2014 (my 2nd year running). Off of my Facebook. But one day I said “Yes, I’ll try”. My 1st few runs were not great, but I kept going for the social end of it. We were running for a charity called Dekpor School Development Organization, a very worthy cause to improve nutrition, water and education in the village of Dekpor, Ghana. I registered for a half maathon, but it seemed so out of reach. Being a “newbie” I made mistakes in training that brought on injuries. But with a braced up knee I ran my 1st half marathon. And I loved it. People do take up running for various reasons. For some it is to lose weight, or to get in better shape. Others may have a goal, such a bucket list item of running a half marathon or marathon. 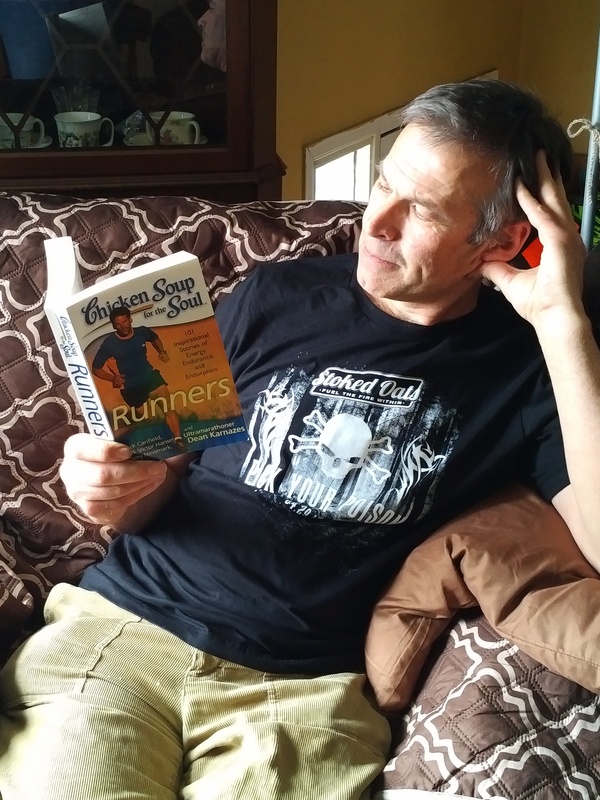 Ultramarathoner Dean Karnazes mentions in the book Chicken Soup for the Soul: Runners that “He started running to decompress after a tough day at work”. The book where I 1st read of how Dean Karnazes got into running. Running has really helped my mental health and blood pressure. I have a passion for running, and I love encouraging new runners. 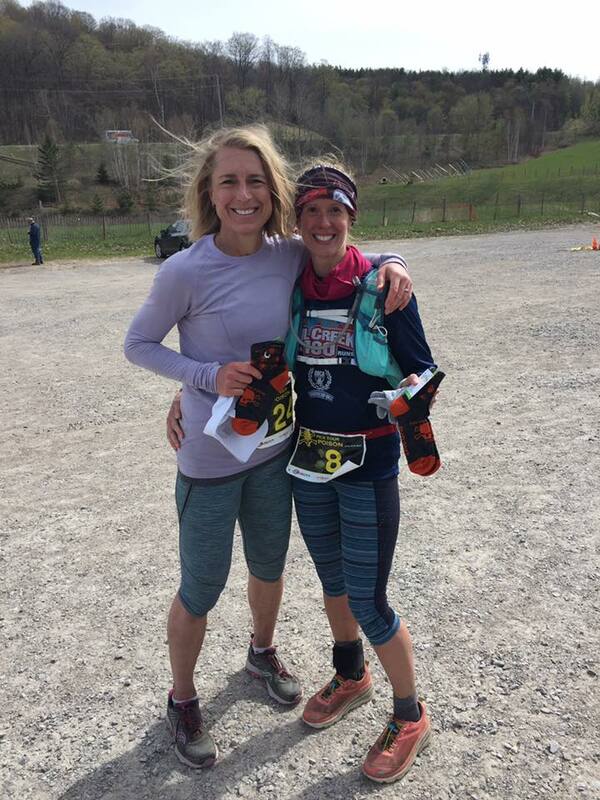 A few weeks ago I had a wonderful surprise at a local Mountain Equipment Co-op race (MEC). Another niece of mine named Katie had secretly (without me knowing) taken up running. What a pleasant surprise and inspiration to see her there to accomplish her 1st 5k. My niece Katie celebrating after her 1st 5k. 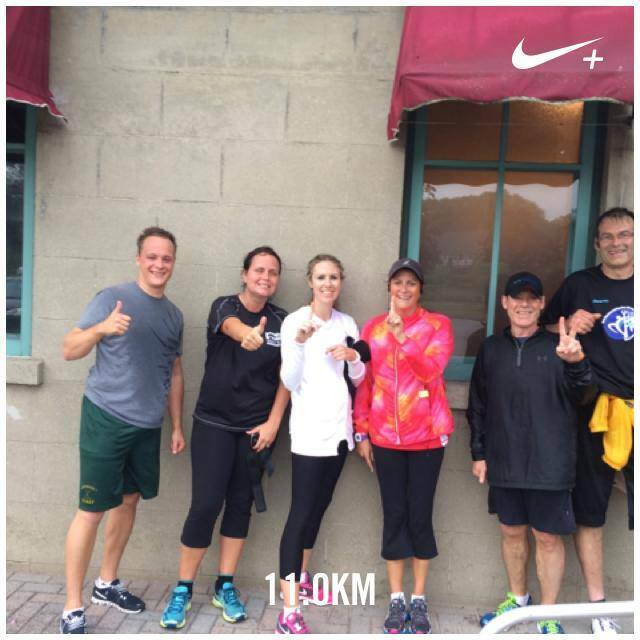 And in the running club at work, it brings me great joy to have new co-workers join. It is so very inspiring. There is a new runner named Michelle whose goal is to run her 1st 5k event at the end of the month, and run it without walking. I’ve never really thought I had much influence over others. But in our 1st running club meet up of the year I ran alongside a runner who is a new group member named Shannon. I only ran alongside her for a couple of kilometers. 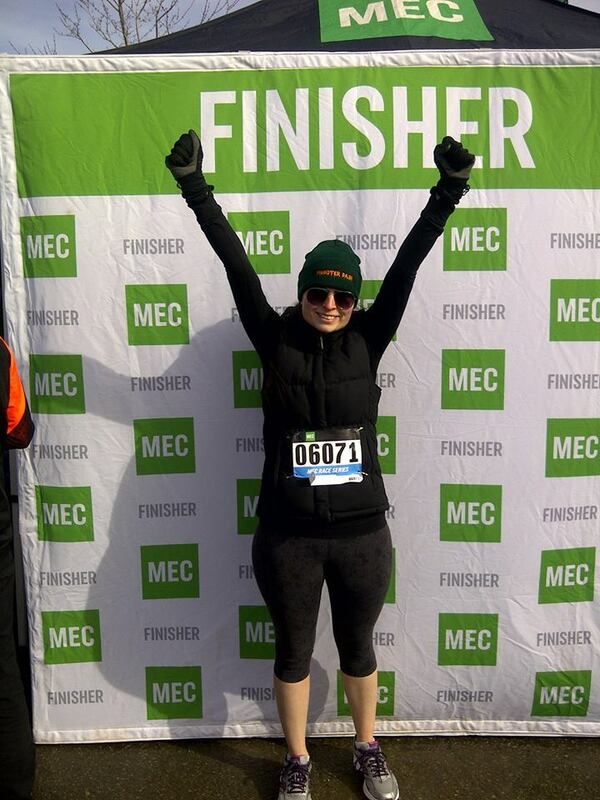 Since that run she has made it very clear to myself and the group that she wants to become an ultramarathon runner. Some of my wonderful running club members from work. Our new runner Michelle (on her 1st run that day) is on far right, and Shannon, aspiring to be an ultrarunner 2nd from left. To me the ultra running community is becoming like another family. With Pick Your Poison being the 1st race of the season after a long winter it seemed like a happy family reunion. So many hugs and handshakes, and because I am still fairly new to the ultra community, there were a lot of new introductions. Connections that could be very valuable in my running journey. Love meeting new runners at these events. My niece Caron (in centre) and her 2 friends who I have heard a lot about….Kristy on the left and Julie on the right. 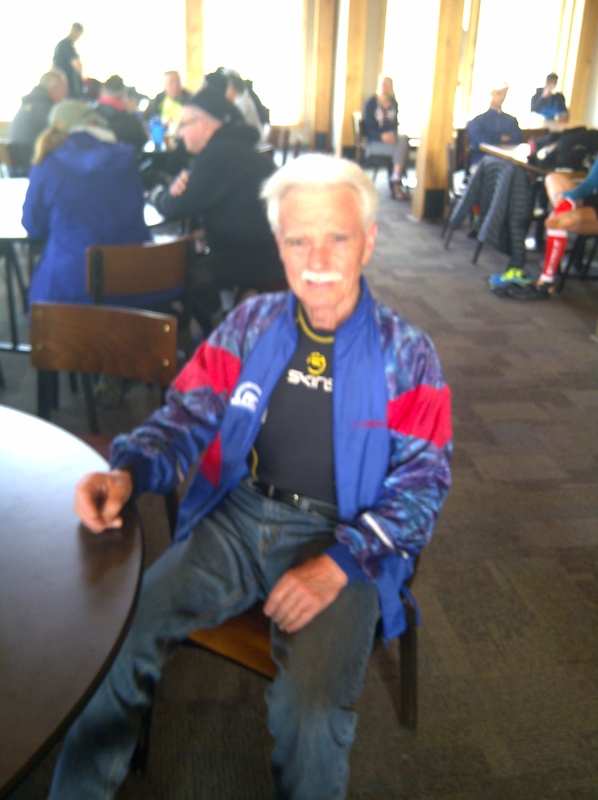 Had a wonderful visit catching up with 79 year old Canadian ultrarunning legend Hans Maier. Last year Hans was one of nine ultrarunners in Ontario to receive the Norm Patenaude Award, given to runners who complete eight or more Outrace ultras in a season. Hans has received this award numerous times. Hans also has completed numerous 24 hour races. Last year he completed 132.233 kilometers in that 24 hour period at Sri Chinmoy. For his age group, he is easily the fastest man in Canada. Spotted Jess Heroux’s orange jersey through the trees above me on one of the switchbacks during Pick Your Poison 2017. There was 71 year old running legend Jess Heroux. 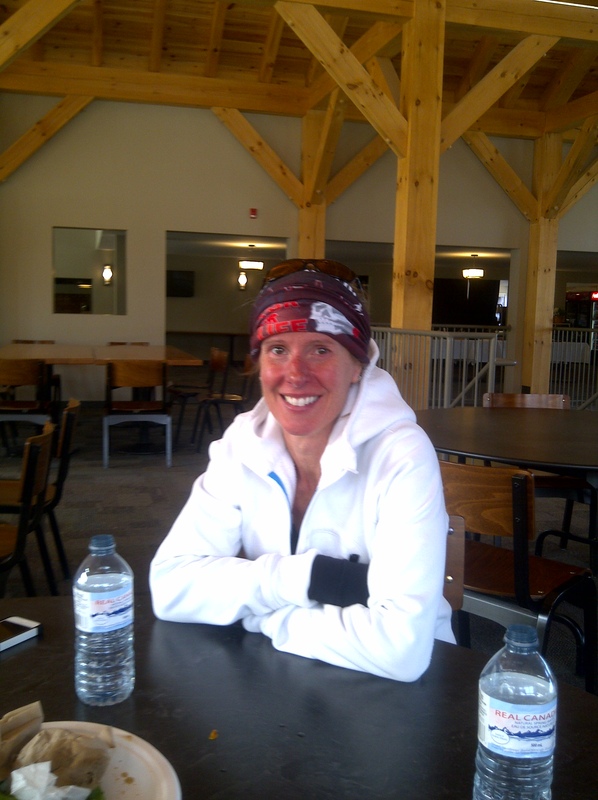 I met Jess for the 1st time at last years Creemore Vertical Challenge. And as we have continued to stay connected we have become friends. Jess had taken a 9 hour bus down from Kirkland Lake to Barrie where his niece lives. I had the privilege of picking him up there and taking him to the race. Before 1993 Jess has run Boston Marathon seven times. He has competed in the major 100 mile ultras, which are Old Dominion, Western States, Leadville, and Wasatch. But in 1993 at 47 years old Jess had an aneurism and on the operating table he had a stoke that almost took his life. He survived but was left paralyzed on the right side of his body. Taken with my friend and running legend Jess Heroux just after my finish. Undeterred Jess continues to compete in these tough events. 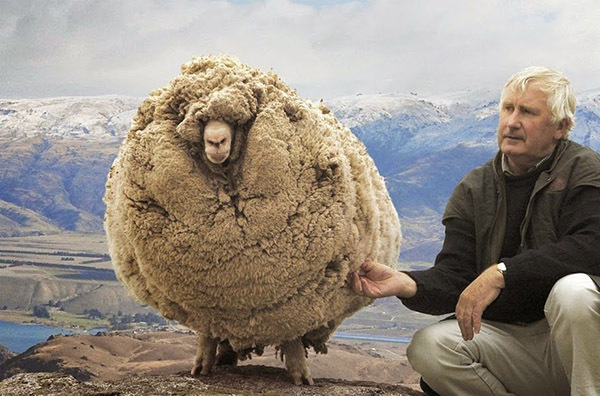 He is now 71 years old. And every time I see how much effort Jess puts into each shuffling stride I am so much in awe. 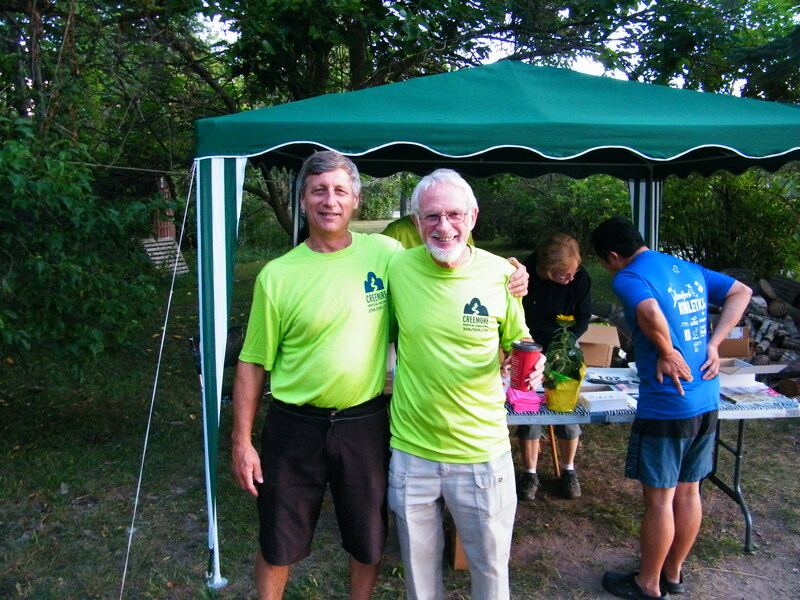 I also met up with popular and much loved race director Pierre Marcoux of the former Creemore Vertical Challenge. This is the event where I ran my 1st trail race and loved it. 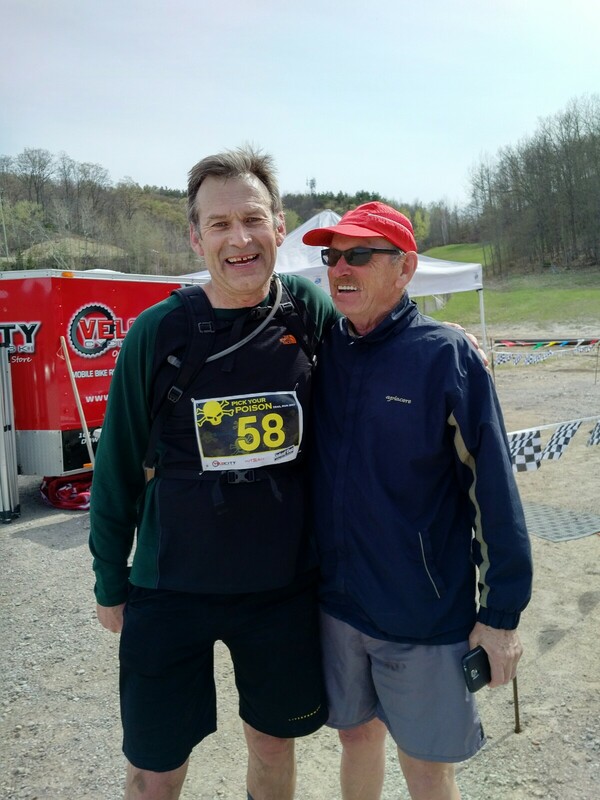 Pierre Marcoux (on left) with running legend Joe Cleary at 2016 Creemore Vertical Challenge. Joe started running at 45 and in the 30 years since he has run 537 marathons and ultras. And then there was a young lady I will simply go by Sonya who was quietly sitting in the chalet with a spectator friend for support at Pick Your Poison. I had a coffee in my hand and was simply scanning the dining hall part of the chalet for more familiar faces when I heard a quiet female voice off to my side, “Looking for a place to sit”? I sat down and quickly noticed how visibly nervous and anxious this young lady was. 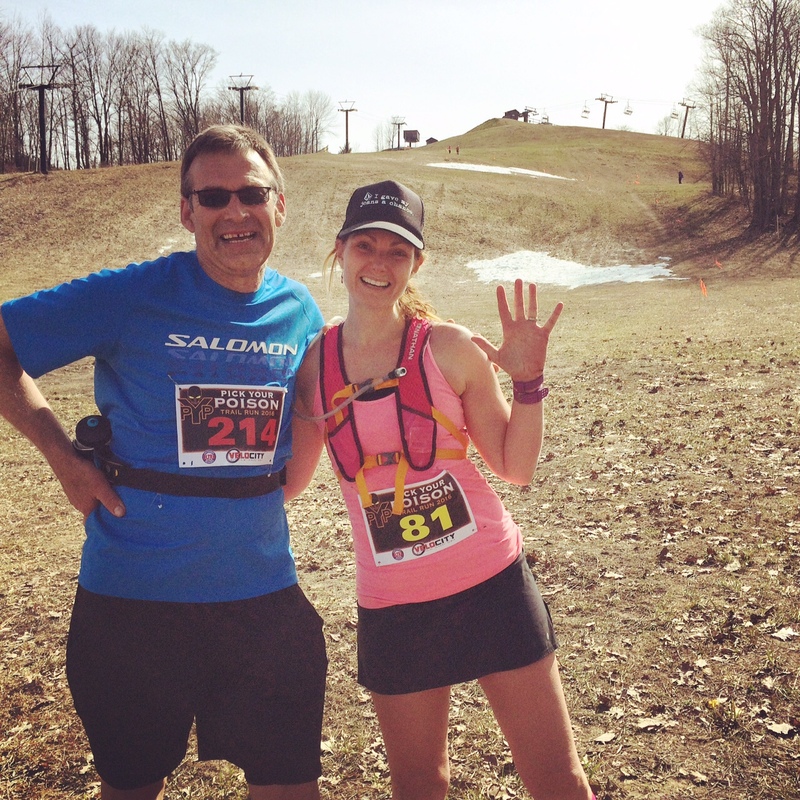 It turned out that this runner was not only running her 1st 50k, it was her 1st ever trail race. And unfortunately the previous runner she had talked to had really frightened her by going on and on how tough and challenging this course was. Trying to explain the course with Sonya, but without any pictures. She was asking for my advice. Yes this course was challenging and tough. I love these events and I did not want this course to break her. I was scrambling to choose my words very carefully. Although not a seasoned 50k runner by any means I shared the little bit I knew. Explained the importance of pacing yourself, walking the steep major hills if you have to, and since aid stations were new to her what was available there. But mostly I shared my familiarity of the course with her. I ran the 4 loops last year, but also sometimes train on the public use portion of the course that goes through the Copeland Forest. I wished her luck and never saw her the rest of the day. Later that day while checking the stats I pretty much jumped out of my skin with excitement while looking where my niece Caron and her friends placed. I saw Sonya’s name there near the top. She tore up that course, finishing 10th out of 32 female runners. 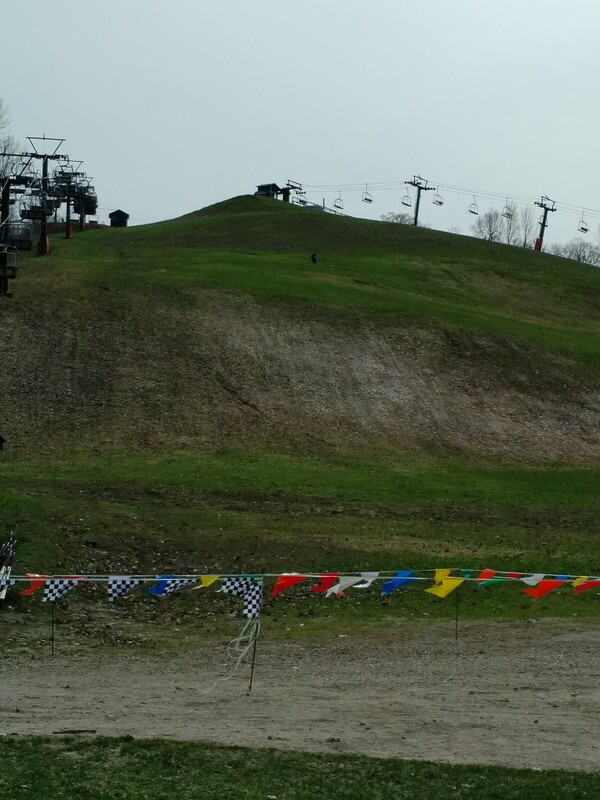 By the time the 4th loop comes around these hills are really tough. It was a perfect day for a race, 7 degrees Celsius and sunny with a wonderful breeze. A couple of days prior it was hot with thunderstorms, the day after there was an all day heavy cold rain. Such a great day for a race! 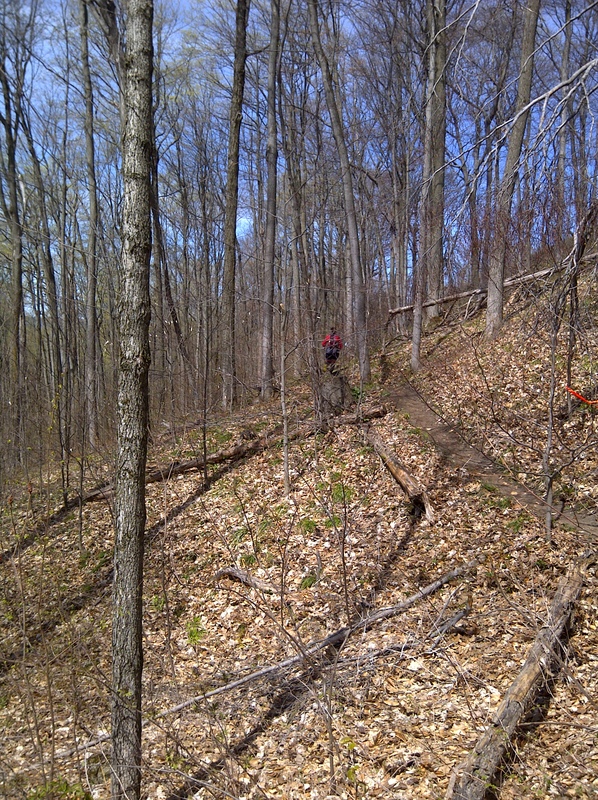 Race director Adam Hill and his crew did an amazing job of trail prep. 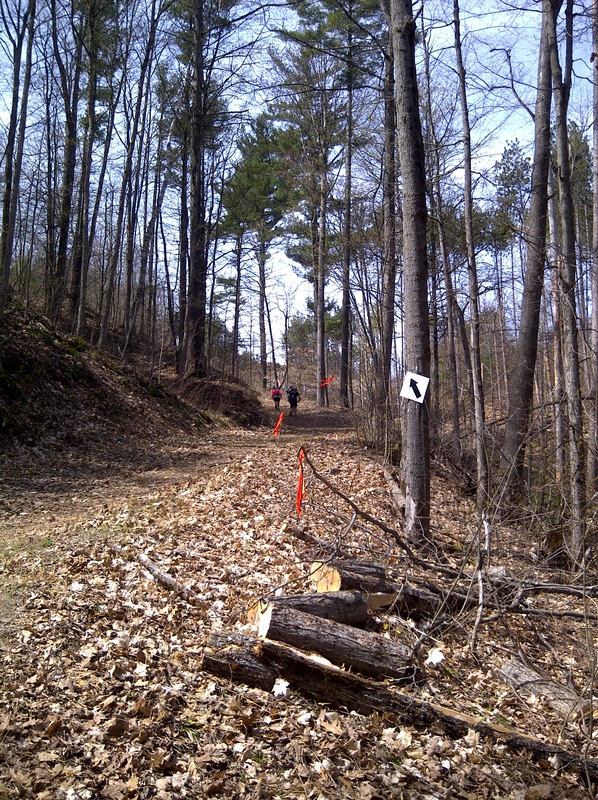 The course was so well flagged with red ribbon and caution tapes to keep runners on course. 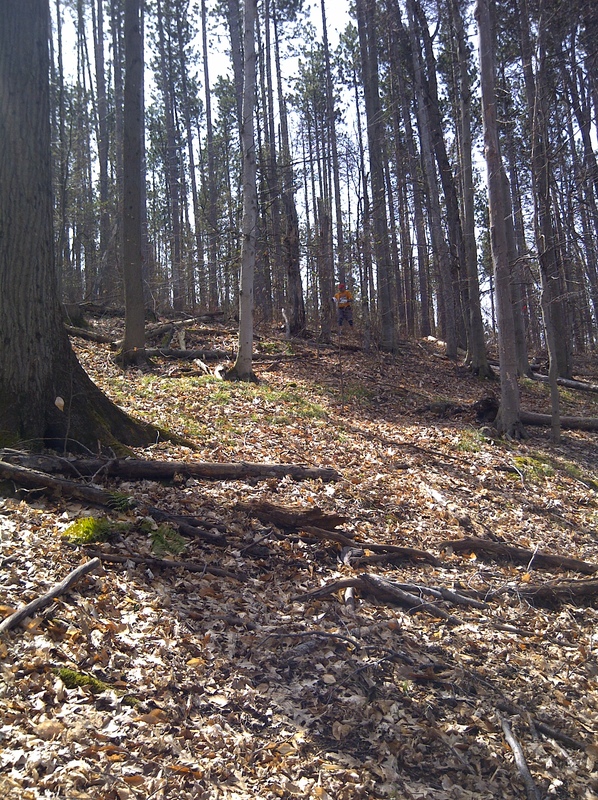 And in the hardwood forest single track it appears to me that either raking or leaf blowers must have been used to clear the trail down to the bare earth. 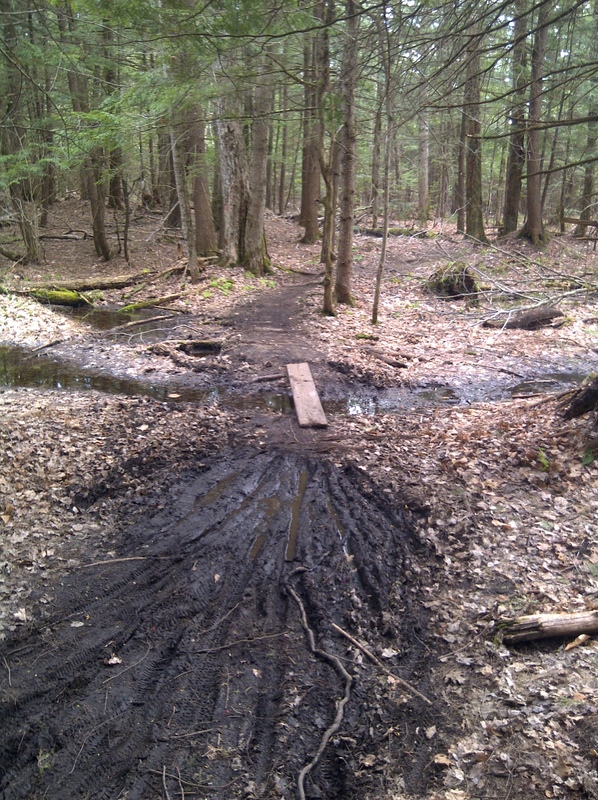 I can’t imagine how many hours this must have taken to clear several kilometers of hardwood single track. The leaf blowing uncovered any hidden holes, rocks and roots so they are more visible to the runner. 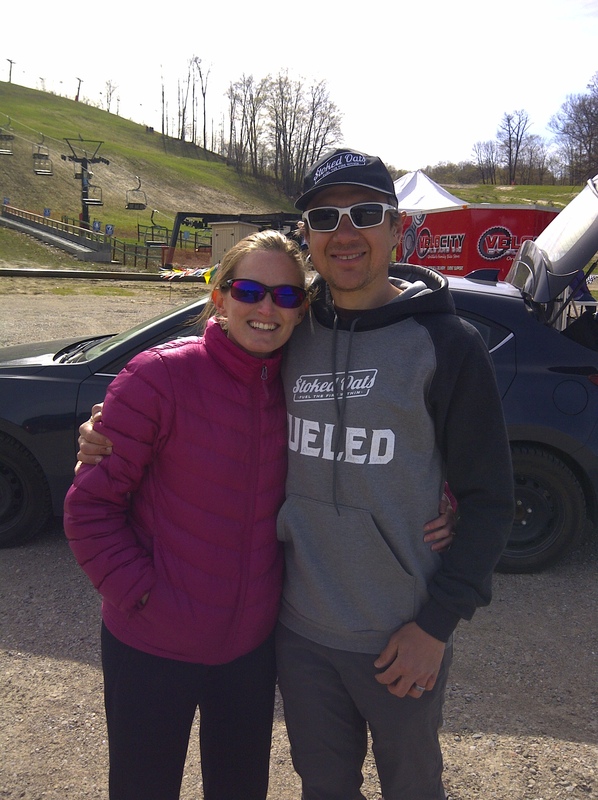 So much appreciation to race directors Adam and Heather. Heather also cheered me on with such enthusiasm after each of my loops. And the volunteers, what can I say. They were amazing. Not only for keeping the aid stations stocked with such an array of choices, but also for their incredible support of encouragement. For me those 1st 2 loops my “go to” food was fig newton’s, my last 2 loops it was those 2 bite sized peanut butter sandwiches. It would have been cold for the volunteers standing all day, but they sent us on our way with such warm smiles and bolstering words of encouragement. Race director Heather (in centre) with wonderful volunteers at aid station during Pick Your Poison race. It was a mass start with the 12.k, the 25k and the 50k all starting at the same time. Particularly in the 1st 2 loops I struck a lot of conversations. There was one gentleman who now lives in Panama. But he has family fairly close and was going to visit with them after the race. Discovered one lady from Orillia (30 minute drive) and another from Penetanguishene (30 minute drive in another direction). When I mentioned I was from Hillsdale, she mentioned she drives through my village often. I told her my wife is crossing guard, she said she sees my wife at her post often and is always very careful. That made me very happy. Sometimes encouragement is just around the corner. Rounded one last corner before the final climb of each loop and this dear lady was encouraging and cheering all of us on. Amazed she spent all day doing this. When I asked “Are you a runner”?, she replied “Definitely”. When the 12.5 runners finished their one loop, there was 120 less runners on the course. When the 25k runners finished their two loops there was another 110 less runners on the course. The last two loops for the remaining 99 runners were very spread out. The elite runners were one to two hours ahead of me. There were stretches for at least 10 minutes that I did not see a runner ahead of me or behind me. It was so peaceful and quiet. Particularly in a course like this, I did not feel that I was running in competition against others, I was running against the course. And the last thing I wanted was for it to defeat me. That final uphill climb of each loop. Came down that last major hill with my dear wife shooting video and pictures about a hundred metres from the finish and my running legend friend Jess Heroux (who ran the 12.5 kilometer course) right at the finish taking pictures. Out of 112 who started the race (or 99 who finished) I came in at 76. 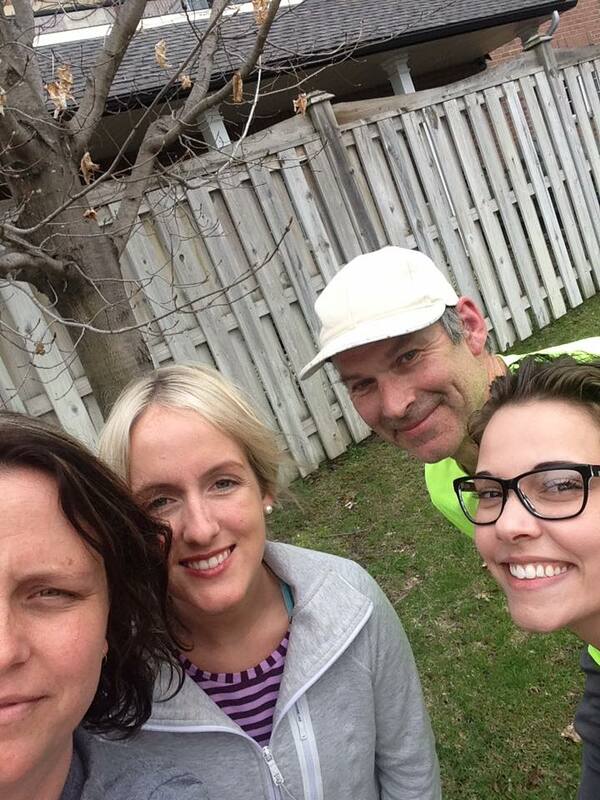 Three minutes after me, my niece Caron’s close friend Kristy crossed the finish and just a few minutes after, Martin, a neighbour friend who lives just one street over in Hillsdale crossed the finish. There was a lot of introductions, hugs and congratulations all around. “What goes up must come down”. My wife shot this picture (I’m in the centre) on my final downhill towards the finish. After running for 7 hours I was shaking and getting chilled in the cool breezy 7 degrees Celsius air and my wife graciously drove Jess back to Barrie. After they left I went in to the chalet to warm up and have a wonderful post race hamburger, salad and a massive oatmeal cookie. Taken by my wife after my finish. I am a mixture of exhaustion and happiness of just having completed the 50k. I was sitting at a round table with my niece Caron’s two friend’s Kristy and Julie. Caron crossed the finish not long after I sat down (finishing two 50k’s in under a week) and joined us. 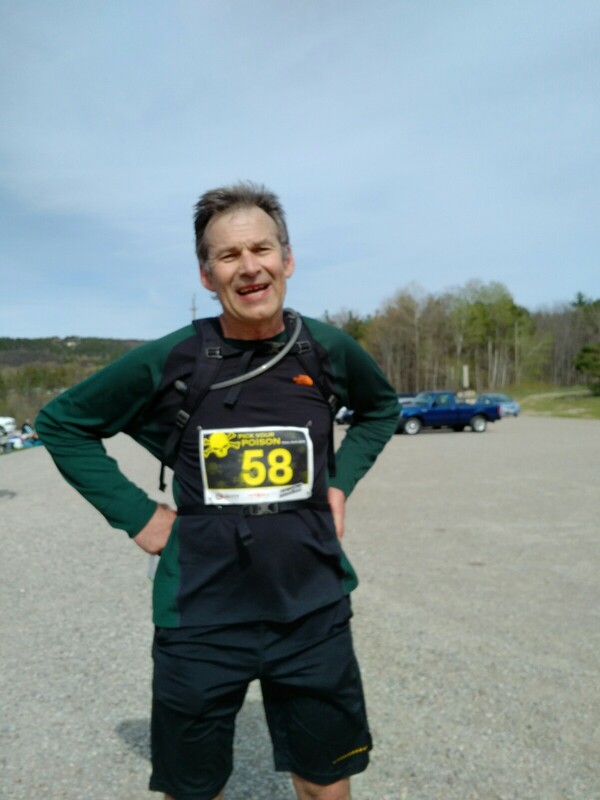 And shortly after that Pierre Marcoux from Creemore Vertical Challenge and now highly involved with the Ontario Ultra and Trail Race Series finished his 50k and joined us. Image is the cover photo of the Sinister 7 Facebook page. Pierre has so many connections in the ultra running world. When he found out my niece was training for Sinister 7, an extremely tough 100 mile race at Crowsnest Pass in Alberta that has 6,400 metres in elevation gain and loss as it cuts through the rugged and remote Continental Divide of the Rocky Mountains, he called over a volunteer lady named Dawn to the table who has run Sinister 7 herself. I loved watching and listening in as Dawn shared some information about the course that could be of great help to my dear niece. There was also a lady named Debbie Bulten quieting sitting at our round table with her running companion for the day. It casually came up in conversation that Debbie (who has run numerous 100 milers) was running a 200 miler on May 27th at Sulphur Springs. I was speechless. For me a 50k is such an accomplishment, and I can’t even get my mind around that distance of 200 miles. That is 322 kilometers. And when I asked her how does she prepare for a race of this proportion Debbie graciously shared as one runner to another how she has been preparing. I found Debbie Bulten very humble, and she graciously allowed me to take her picture for the blog. She is running a 200 mile race at Sulphur Springs at the end of May. I love the ultra running community so much. As a “mere 50k runner” I never feel looked down on by the elite 100 mile runners. And when I think of elite runners who really care for the average runner I think of Mr. Ultramarathon Man himself Dean Karnazes. Coming home from bib pickup I was so amazed with that #58 (which was my age). And what became of that picture I took and posted it on Facebook and on Twitter? Later that evening I discovered there was a retweet on Twitter with a few words of encouragement from Dean. It said, “Love this Carl. Good luck, have fun”. And I did have so much fun. I met Dean for the first time at the North Face Endurance Challenge last year in the Blue Mountains, and was so amazed when he wanted to hear about my running journey. 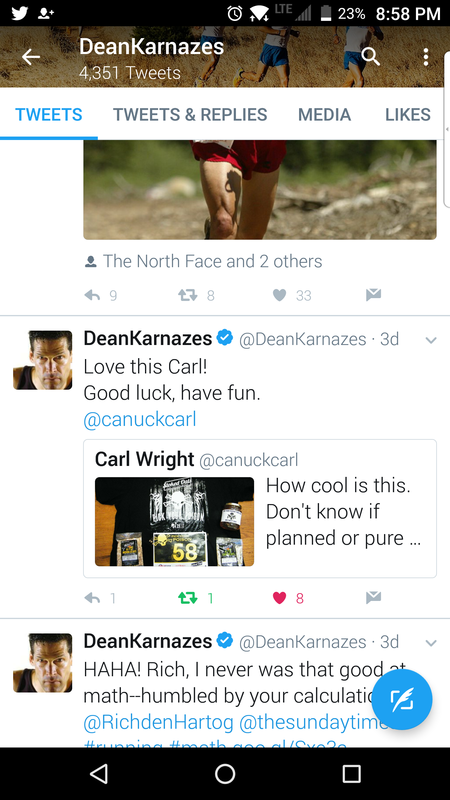 Dean Karnazes is one of the world’s greatest ultra-marathon runners, yet he continues to take an interest in, and encourage the average runner such as myself. This is so incredibly inspiring, and leaves such a huge impact on me. Words of encouragement from Dean Karnazes. To all those runners who are such an inspiration to me. To my two nieces Caron and Katie. To Michelle and Shannon in the running club. To Hans and Jess, two runners in their seventies, in whom I greatly admire. To Pick Your Poison race directors Adam and Heather who give of themselves so much, and my 58 year old friend Pierre now so involved with OUTRace. To first time trail runner Sonya for giving it her all on her 50k. To the unknown lady spending all day cheering us up that final hill of each loop. To Dawn and Debbie, two established 100 mile ultra runners who are so humble and willing to share at Pick your Poison. And to Mr. Ultramarathon Man Dean Karnazes. So well known with so many awards, distinctions and accolades. Yet has not forgotten the ordinary, average runner such as myself. I don’t run with a timing device or activity tracker. This is kindly shared by my niece Caron. 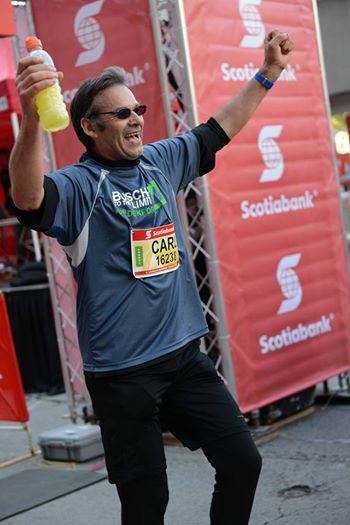 Running Challenged: Pierre Marcoux is former director of that amazing Creemore Vertical Challenge and now is heavily involved with OUTRace (Ontario Ultra and Trail Race Series). He is also attempting the Norm Patenaude Award this year. This is given to a runner who successfully completes eight of the eleven ultras in the OUTRace series. Only nine runners received it last year. As a fellow 58 year old, Pierre really wants me to join him on this. Wish I could so badly. But don’t think my already heavy schedule would allow it. The Rendezvoo Point: Saw this post written by Patrick Voo on the Pick Your Poison Facebook Page under “visitor posts”. I have seen Patrick at various events. He is always smiling, upbeat, friendly and encouraging. West Grey Runner: Ron has run the 50k at Pick Your Poison for seven of the nine years it has been running, which is amazing. Its all in that ‘yes I can’ attitude. And yes you did. Yes you will do. And yes I keep on one step at a time. Marvellous. Great post. I am trying now to get back to running. Just makes me feel better. Absolutely love doing it. Great post uncle Carl. I can always come here and find the most positive perspectives on running. I loved watching you rip up those hills and reading this. Happy trails! Carl you are an inspiration! Oh my that is fantastic. Congratulations on your finish and on the community minded person you are. No doubt about you are spreading sunshine wherever you run. This is simply amazing and inspiring! Just as I have been making excuses to not get back on the track, I read this. Just like you have been helping new runners.. lazy ones are getting motivated. You have had such an incredible few months Prajakta with your wedding and travel. You will never regret taking that time away together. What I have heard of cross fit is that it is a really great workout. So well done. This is awesome, Carl! I’m inspired to see if I can’t meet you at the start line of this race next year! Thanks for the great writing; I really enjoy it! Thank you so much Daniel. You are always so kind with your words. It is a great event. Hey Carl! Great race report as always. You are certainly correct – Pick Your Poison was like a homecoming event. Wonderful to see you and the other 100+ “close family” in our trail and ultra community! Hope your hectic schedule allows you to get out to another event soon, and hope to see you then. Reading between the lines of your post, I can see a 50M race report in your near future. 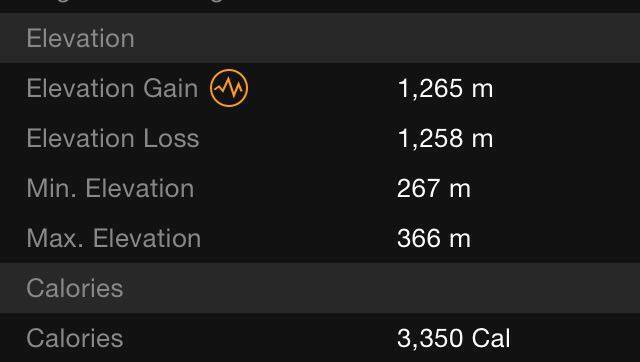 It took me years to jump from 50K to 50M, but it isn’t too large a training difference – mainly investing in back-to-back runs. So cool to see how many people have been inspired by your running – keep up both the blogging and running. Thank you soo much for sharing this Pierre. It was indeed a wonderful trail and ultra community reunion at Pick Your Poison. You are absolutely correct. I am registered for a 50 miler in the middle of July. Will have to see what is available in June. Have heard the Sulphur Springs is sold out. Crazy how running can make you so emotional. The ups and down, anticipation, etc can be overwhelming. What a beautiful and inspiring post Carl. I loved learning about the people you met and their stories. That’s so cool too that your nieces share a passion for running with you. Great pics too, it looks lovely up there! Oh I bet Carl! There is nothing like the renewal of spring with the promise of summer just around the corner. Have a great day! So glad to have found your blog! We are connected on Twitter already. 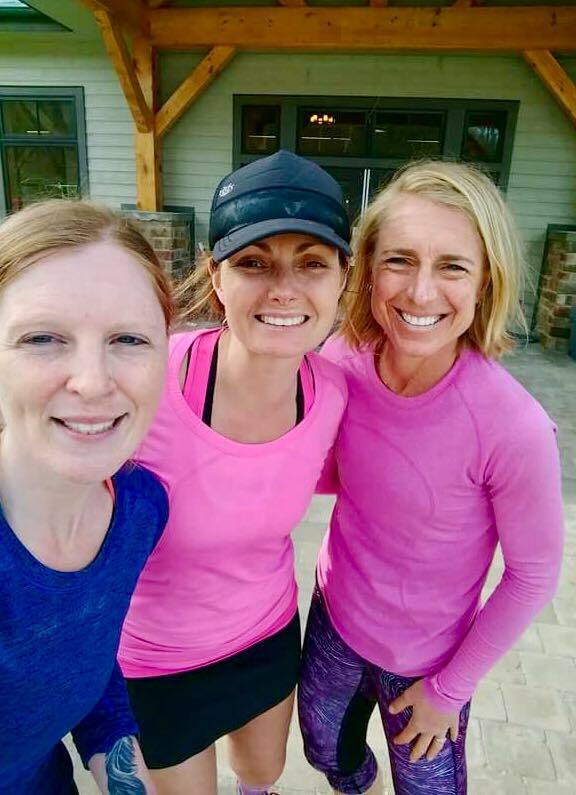 I love connecting with Christian runners! I didn’t start running until age 43 so it’s never too late. My passion for running and for God led me to writing a devotional book for Runners. So many parallels between running and our journey with God! Part of my proceeds benefits WaterStep, a nonprofit in my city that provides clean water in developing countries.